Last year after spending $12.5 billion to buy Motorola MSI mainly for its patents, Google is in process to evolve as prominent cellular manufacturer to produce innovative products. 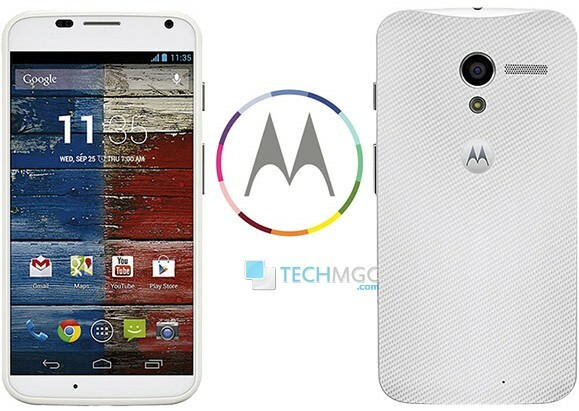 And finally, Google has wrapped off it’s highly anticipated new smartphone dubbed as, “Moto X”. This new smartphone was one of the favourite topic of discussion for tech experts across the industry from months is finally revealed. From the launch of Moto X, Google is aiming to give a tough fight against the other premium smartphone vendors by offering it’s device with some ultimate new features and specifications. In terms of frame up, this device sports a huge 4.7 inch of Capacitive RGB Amoled touch screen display 1280 x 720 of pixels resolution. This huge range of pixel resolution will make the display more clear and crispier by delivering ~316 ppi of pixel density. As compare to other devices in the market which comes with manual control on the front and side of the smartphones, Motorola X deemphasis manual control means the hardware buttons. The touch screen comes in a favor of always-on sensors built to respond to speech, gestures, and context. And customers will be able to customize many features of the device when they order it. This touch less control is the starring feature for this smartphone. Without touching the device manually, and by simply saying “Okay Google Now” followed by a command can make a phone place a call, get directions, perform a Google search, or more. The phone’s accelerometer can also tell whether you are in a moving car and tailor its commands and notifications accordingly which is really commendable. Google is struggling to prove the value of the purchase with new products and features to regain sales Motorola has lost in recent years. Motorola had a small fraction of the smartphone market during the first quarter, while Samsung and Apple had almost half, according to Gartner Inc. Dealing with it’s platform dependency, this device sails on Android 4.2.2 jelly bean operating system powered with a custom-built Motorola X8 Mobile Computing System , based on a Qualcomm Snapdragon S4 Pro chipset. Motorola added two additional tiny processors to the Snapdragon S4 Pro system-on-a-chip(1.7Ghz dual-core CPU, quad-core GPU). One is for natural language processing, and the other is for “contextual computing” (in other words, managing all the phone’s other sensors). In terms of overall body an dimensions, this device weighs 130 gms and measures 129.3 x 65.3 x 10.4 which makes this device ultra-sleek and lightweight to carry anywhere,anytime. To enhance the gaming functionality for this device filled with immense graphics feature this device is equipped with Adreno 320 GPU card. To lure the buyers, Motorola is touting the phone with customizable colors and features. Enumerating it’s storage specifications, it comes with 2GB of RAM which looks more than enough for today’s computing task on a smartphone, useful in smoother multitasking and playing huge graphics game smoother with no hassle. Internal storage options are not clear, as per the sources it will comes with two storage options 16GB/32GB. Imaging optics at a glance, if you hold the phone up and twist your wrist, this activates the phone’s camera, reducing the time between pocket and portrait to two seconds as company claims. It comes with both the primary and secondary snapper options, on the back panel it include a primary camera rated at 10 MEGAPIXEL whereas on it’s front it includes a secondary camera rated at 2 MEGAPIXEL for video calling. Some of the other features of camera includes auto-focus Clear Pixel camera with 1.4 µm-sized pixels, f/2.4 aperture, native 16:9 aspect ratio, face detection, HDR mode, panorama, geo-tagging; Full HD (1080p) video recording at 30fps with HDR. It also comes with a quick capture allows you to activate the camera with a double twist of your wrist. Connectivity features allows the user to use 3G, 4G, Dual-band Wi-Fi a/b/g/n/ac, Wi-Fi hotspot, Bluetooth 4.0 LE, standard microUSB port with MHL and USB host, GPS receiver with A-GPS, GLONASS, 3.5mm audio jack, NFC, wireless screen sharing (Miracast protocol) which makes it a house full of latest connectivity options. To supply this device a proper need of power supplement, it is equipped with 2200mAh of battery which claims to deliver a decent amount of talktime. Counted among the leading smartphones manufacturer and service provider, "Spice mobiles"